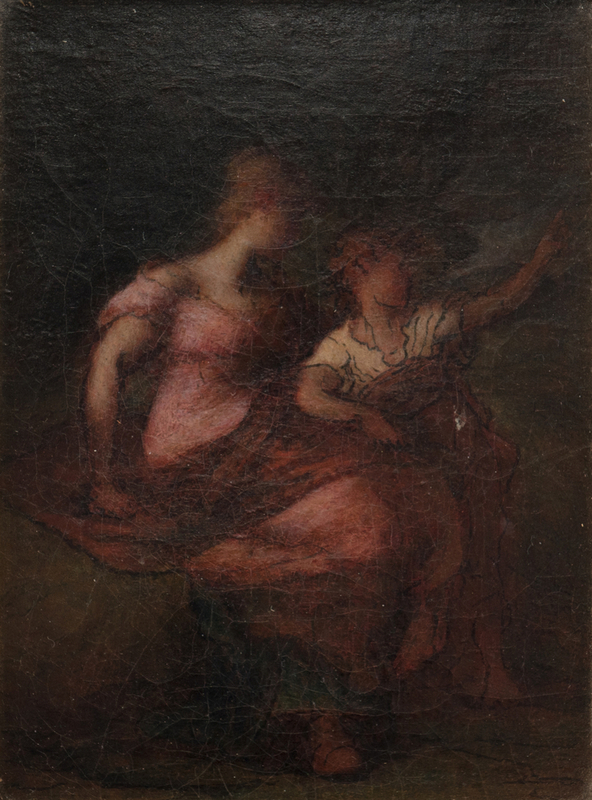 Robert Loftin Newman (Tennessee/NY/France, 1827-1912), oil on canvas painting depicting a woman and boy in a landscape. The woman wears a long, rose colored dress, and the boy is pointing to something overhead. Painting does not appear to be signed. 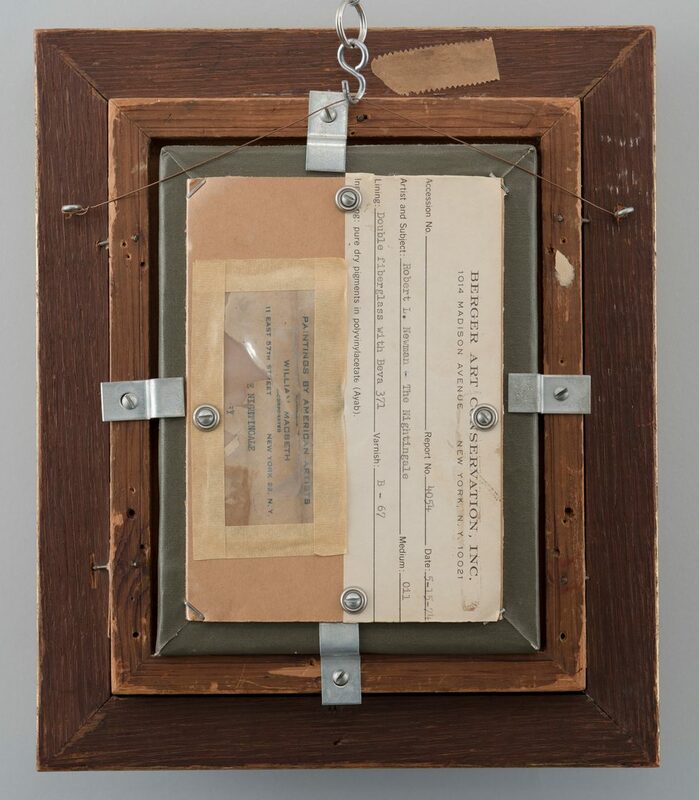 Paper label preserved verso for William Macbeth Gallery, New York, identifying title as 'The Nightingale.' 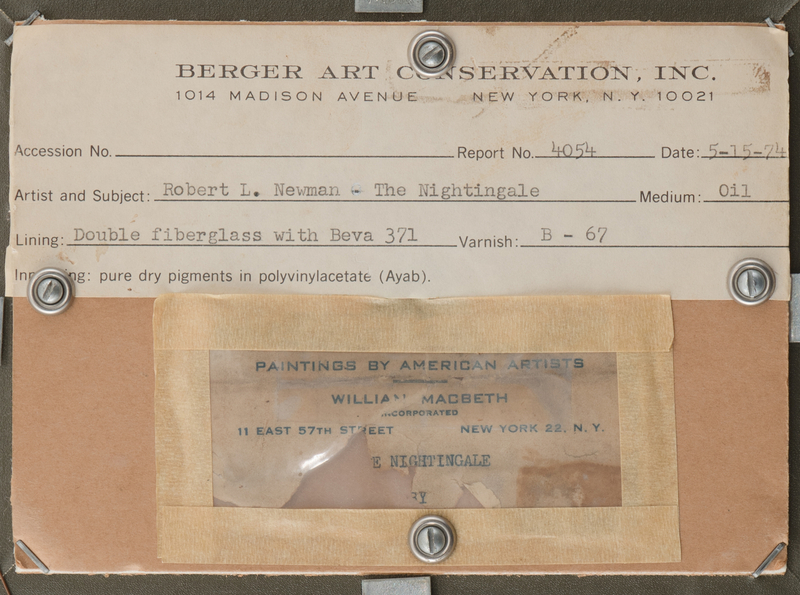 Additional 1974 art conservation label from Berger Art Conservation (NY) identifies Newman as the painter and notes a double fiberglass lining with Beva 371 and B-67 varnish. Giltwood molded frame. 7 1/2' x 5 1/2" sight, 12" x 10" framed. Provenance: The living estate of Dr. and Mrs. Benjamin H. Caldwell, Nashville, TN. Biography: Born in Richmond, Virginia, Robert Newman grew up in Clarksville, Tennessee. 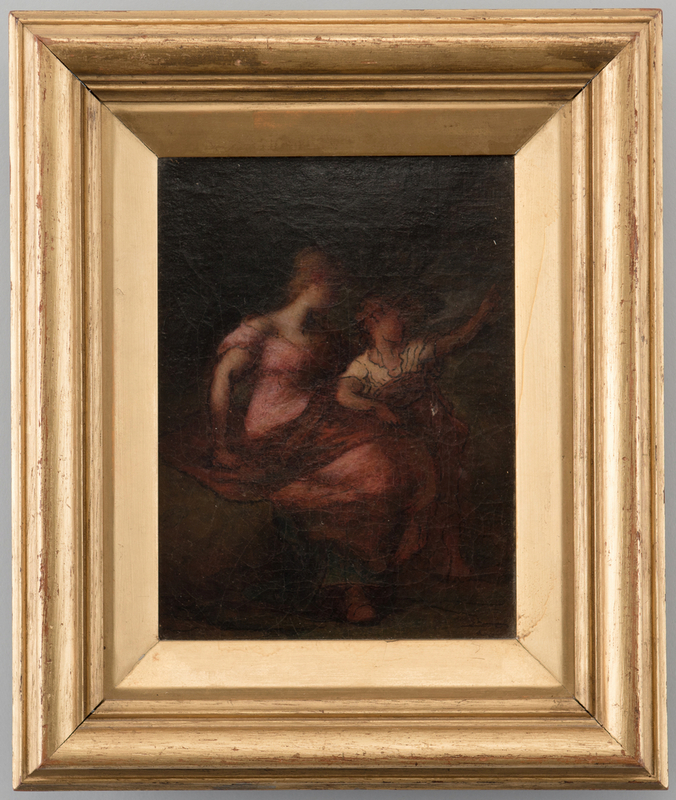 He is sometimes associated with Albert Pinkham Ryder, with whose work he shared thematic and stylistic affinities. Mothers and children were frequent subject matter, along with Old and New Testament themes. He studied briefly with Thomas Couture in Paris in 1850, but aside from that, received no formal art instruction. Newman served with the Confederate forces during the Civil War before moving to New York. He returned to Tennessee, in 1872 and tried to establish an academy of fine arts in Nashville, but by 1873 he was back in New York, where he resided the rest of his life. He rarely exhibited his work. Source: Matthew Baigell, "Dictionary of American Artists" ; Peter Falk, "Who Was Who in American Art." CONDITION: Relined (see description for conservator's note). 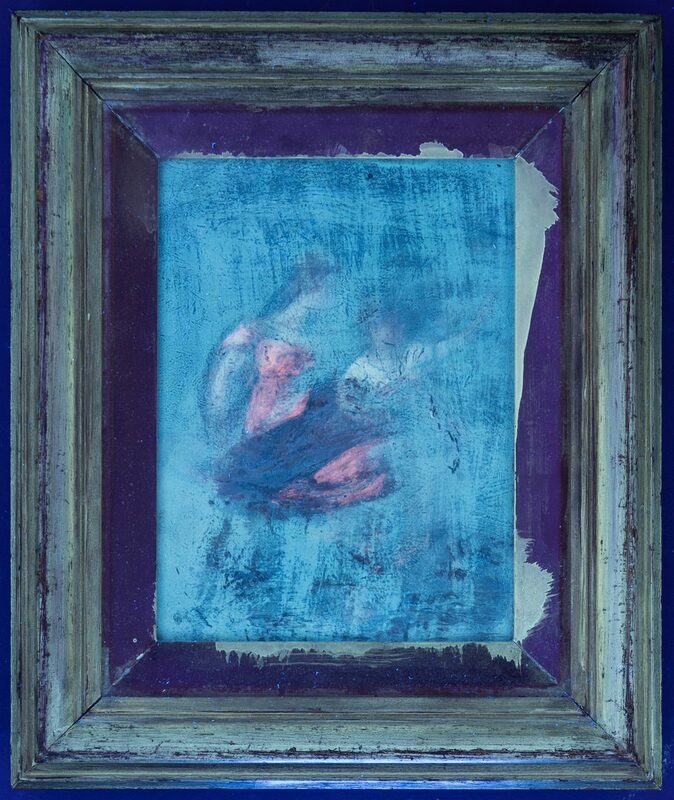 Impact craquelure originating from point above the woman's head, 1/8" tear in area of boy's upper leg. Some wear to perimeter of canvas along frame. Some wear to frame.